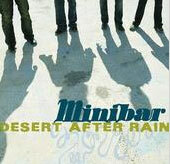 British rootsy-pop quartet Minibar came to America because - by their own admission - they couldn't get signed in England. So they busted their collective asses gigging as a cover band in a Mexican restaurant in the depths of London to earn money. They arrived in Los Angeles for two weeks (all they could afford after swigging copious amounts of British beer at said gigs), to see if the land their distant forefathers settled would be kinder to them. It was. Two gigs later, the band were signed to a major label deal. Blessed, you'd say? Not exactly, their beginnings may have been a walk in the park but that was two-and-a-half years ago and the band, caught in a music-industry maelstrom of mergers and their label's relentless quest for radio-friendly singles, has only now released their debut, Road Movies. Simon Petty, lead vocalist and main songwriter: The deal took nine months to angle because of the merger. So we signed in May '99 and we couldn't get our visas until July. Then we got here and they (Universal Records) were like 'You got to write more singles and you got to fine tune.' So we didn't start recording the album until Jan 3, 2000. Sid Jordan, bass, piano and backing vocalist: The last remix was what, a month ago? So it's been in the remixing stage for over a year. Simon: They're still goofing around with stuff. We got a rock radio mix by Toby Wright, who we have absolutely no connection with, but he did Metallica so he knows his rock. Virginmega.com: He also produced, engineered and mixed Tantric's album and mixed 3 Doors Down and Primus. Were you happy with the mix? Simon: (shrugging) We didn't even know that it had been done until afterwards. We don't even know if it's gone to radio but the original mixes are the majority of the album and they're great. So it didn't really matter in the end. Country-inflected rock and somewhat reminiscent of Del Amitri, Minibar's T-Bone Burnett-produced album still contains elements of British pop. From the emotional introspection in "Six Foot" to the bittersweet but catchy "Holiday From Myself," the 11 tracks have bouncy, airy melodies and distinctive lyrics. Simon: "Holiday" is a great song. I think it should be the first single. Virginmega.com: It's changed a bit from the first time I heard it 18 months ago although the riff is basically the same. Sid: We played everything. It took like a whole day making it. It was really cool. Then the song went off into this kind of space rock territory. It was really fun. Amazing. But that got wiped. Simon: �there's two different music industries if you know what I mean. Simon: The thing was, we were under intense pressure to write a single for radio. Because we were unable to fulfill the correct criteria for a single ourselves, the label was looking for a cover. Enter the Ryan Adams' (Whiskeytown singer and solo artist) penned "Choked Up." The two bands share the same engineer Rick Will, who happened to be playing the track when the Minibar lads were listening. They fell in love with it and did their own version of the song. (The track didn't make it onto Whiskeytown's new release Pneumonia, although Lost Highway Records may release it on a future EP.) Minibar's label loved it. Simon: In an ideal world I would love "Road Movies" to be the single. I really love it and I'm really close and personal with it. It was the first song we wrote about coming here. Lines like, I've got two straight weeks/ To lay waste to Babylon. That was it. That was our few weeks that we had to come out to LA. It's about us, the band and the people and it's about hoping. Simon: Sid's got the song on the back of the directions for getting to Ryan's hotel. Sid: Ryan's like a factory. He's coming out with stuff all the time. He's really generous and nice. He was talking about our record and he was hyper. He gets out this month's Revolver and reads this glowing review of our album and he's like, 'See that's it. That's what it's all about.' Then he says, 'I've got this song for you. It's just an idea and I want you to have it and check it out.' Then he comes out with it and I was like, 'Well it's done isn't it and that's it.' And he goes 'Oh no, we've got lots of work to do.' I love that general kind of free spirit. Some people can be so kind of protective of their little bit of talent whereas he is exceptionally gifted, incredibly gifted. ©2000-2001 Virgin Entertainment Group, Inc.